Unfortunately, I was not able to attend Liithi Lushede's Yule ritual this year. I had an extremely worrying and damaging GI flare which left me nauseated and in pain for over a week. I had hoped it would clear up by Sunday, but that didn't happen and something had to give. That was regrettably the Liithi Lushede ritual. That being said, I was determined in my absence to give my circle a ritual they would never forget, particularly since we added two new members! 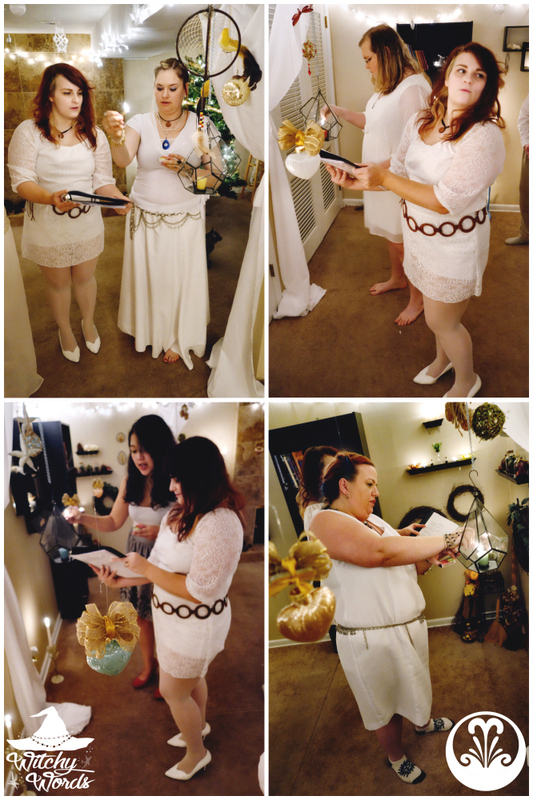 Circle of Fountains had the honor and privilege of welcoming Amy and Abby as Primary Members! We've been long time friends, but our shift to Sunday nights meant that they could finally join us. We are so incredibly happy to have them! With their joining, Circle of Fountains is complete and is only accepting Guest members from here on out! 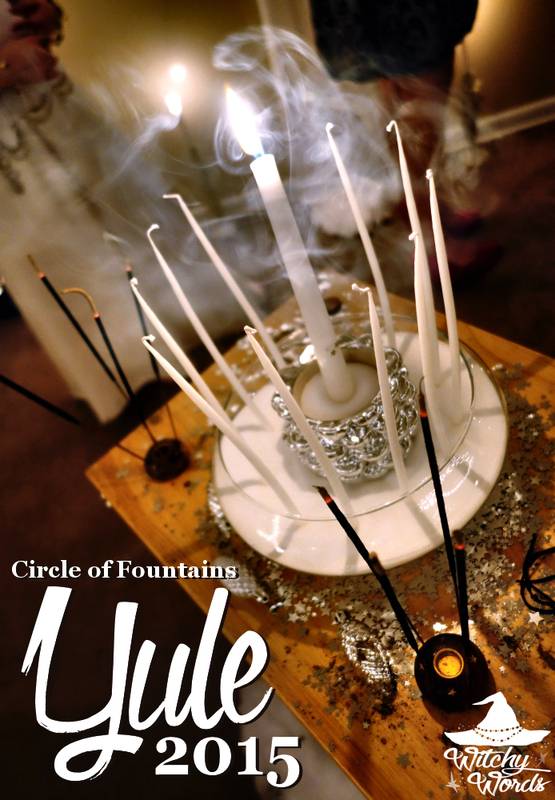 Circle of Fountains Nutritionist, Kolika, decided she wanted to make this ritual's potluck hors d'oeuvres! Members brought everything from bacon wrapped little smokies to meatballs to baklava and more. I wish I could have had some, but I felt so ill that there was no way I could eat anything. I ended up making smoked salmon and feta with dill on cucumber and it went over pretty well! The combination sounded good but I never got to taste it, sadly. Aren't those little plates the cutest darn things, though? Everyone had a different focus. 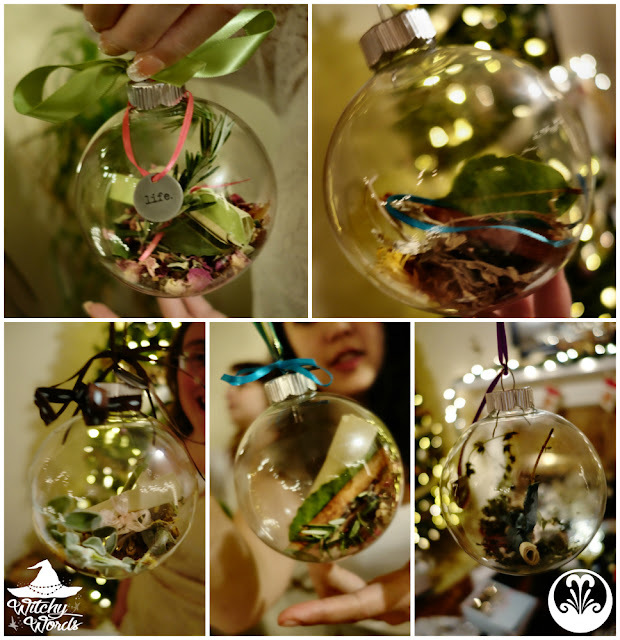 Mine is in the upper left corner and was all about bringing to life that which was stagnant. Since making the orb, I received a paycheck from Witchy Words ads, got several commissions, one of my agencies contracted me for several 2016 gigs and my health is slowly getting back en route. Not too bad! Also, you may remember from last year's celebration that we each wrote down one thing we would like to release and one goal we'd like to achieve for 2015. This year, I read those items off to see how we did. We then wrote new ones for 2016! 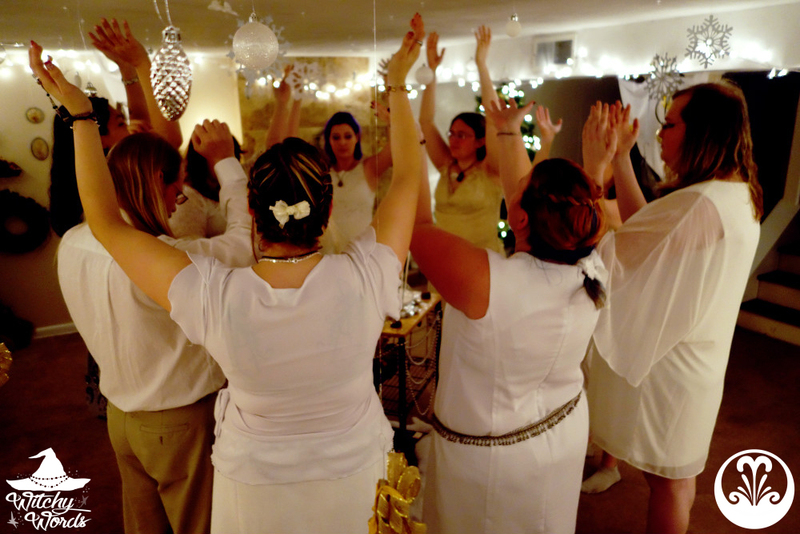 Once we were ready, I led my circlemates downstairs into the dark for ritual! The winter solstice represents many things to many people, but it is characterized by being the longest night and the shortest day. Well, in theory. Scientifically, the longest night happens long before the solstice here in Kansas City, but the representation still remains. To begin, we took a moment to embrace the darkness of the longest night by standing in it united. However, even in the darkest hours of the longest nights, the spark of life lingers on. For me, Midwinter is a celebration of the coming of the light, that spark within the darkness that keeps us moving forward. It is a time of renewal, of starting over, of a clean, blank slate not unlike the one the earth gets when wrapped in the cold snow. In fact, I requested that each member wear white to represent this blank slate, this starting anew. ... and lit every white candle within the ritual room to welcome the spark of light into the darkness. One of my circlemates, Larry, even started a fire with his wife Phaedra's Yule log from the past few years! ... and the circle was opened. Circle of Fountains is a non-denominational, interfaith pagan and witchcraft group. Because of this, I always leave room in ritual for everyone to call upon a deity, guide or spirit of choice at the beginning of our rituals. Some of our group have patron gods and goddesses whom they call upon each time. Still others choose certain gods or goddesses based on the holiday. And still others, such as myself, are non-theistic. I instead honored a relative who passed away this month and whose birthday was on the winter solstice. With that, our altar began to take shape! A note that I'm certainly more modern in my practices. This will become more apparent with this ritual, but I'm sure it's already noted by the use of faux snow around the bottom of the altar. I can't get over how gorgeous this altar turned out with it though! Because I wrote and led two rituals back to back, I also included continuity within those two rituals. I reminded my circle that, at Samhain, we banished the darkness within our hearts, leaving a blank, clean slate to start with. Tonight, it was time to find the spark within. Hanging around the circle were glass hearts. In order to find that spark of light within ourselves, we must first know ourselves. Each circlemate was asked to choose one heart and imbue it with everything that was uniquely them. As they charged their heart, they spoke to the circle about ways that they have changed in 2015, who they are now and who they think they will become. Obviously, recognizing change, especially for the positive, can be deeply emotional. 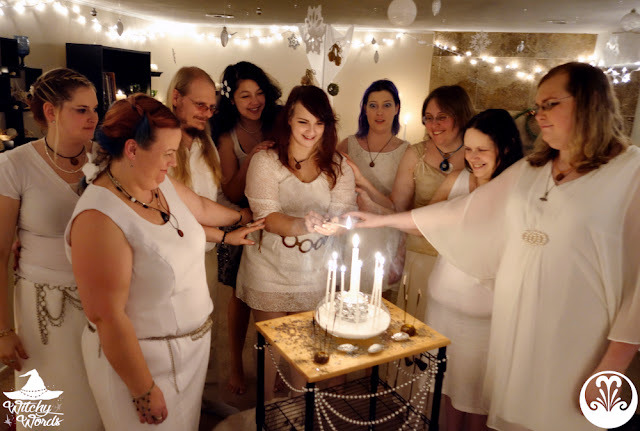 Tears were shed, group hugs were rampant and the entire circle was filled with hope and positivity - a shift from our Samhain ritual which focused on removing the negative. Once our hearts were charged, we returned to the center and I spoke briefly about the two sides of our hearts. The first side deals with external influences and the physical world. Bringing out the Yule log, I asked each member to write with a marker on the wood something physical and external that they would like to change or focus on for the upcoming year. Members chose everything from health to a new house to a brick-and-mortar shop and more. ... and placed the log into the fireplace! And up in flames it went! A yule log that catches fast is a positive sign of things to come! Of course, the Yule log was burned not only over the ashes of Phaedra's previous Yule log but a vial of the ashes from the previous mini Yule logs from 2014. The next morning, I went down and scooped an immense amount of ashes into a heart-shaped jar for next year - or perhaps some spell work throughout the year as well, depending on what we choose to do! We then returned to the center once again and I spoke of the second side of our heart: That which deals with the emotional and internal. 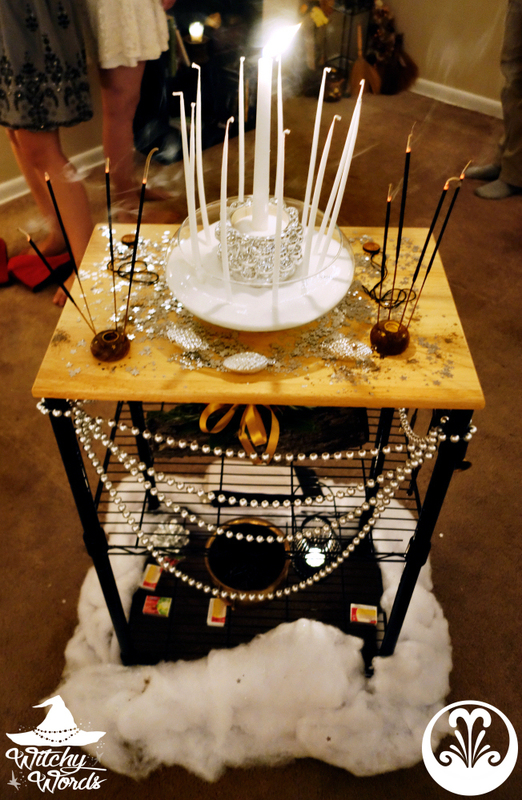 I asked each circlemate to light a candle in dedication to something emotional and internal, something non-tangible. Members chose to dedicate themselves to fighting mental illnesses, to friends and family, to feeling stable or prepared, and more! 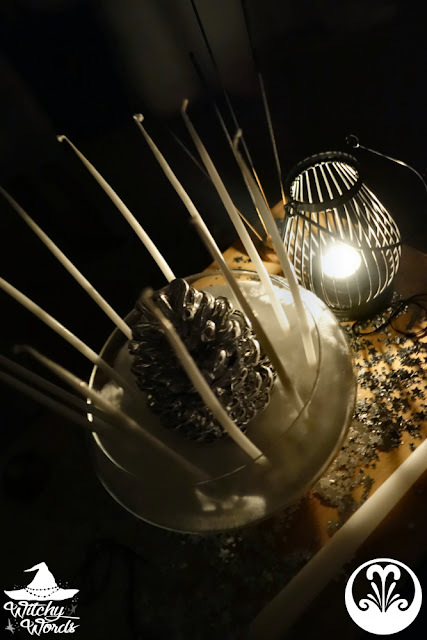 In fact, three members of our circle requested a spare candle so that they could dedicate themselves to their triad relationship, which had intensified over the past few months! They each prepared beautiful speeches and it was truly a moment to witness. I offered Abby and Amy, our two newest Primary members, their own Circle of Fountains pendant. Then, much like we did on Midsummer, we all dedicated ourselves to the Circle as a group! I have to honestly gush that this is, hands down, my favorite picture of us right now. Literally every member is using this as their Facebook cover photo too! It's so impressive, and I am so utterly proud of everyone! We've formed quite the family over the past few years and I cannot wait to see where we go from here! With that, our altar was complete! Now that we had honored both the internal and external sides of our heart, we returned one last time to our glass hearts and filled them with all the positivity of the ritual. The reactions were truly priceless! I'm so glad so many of them were caught on camera! ,.. and closed the circle! 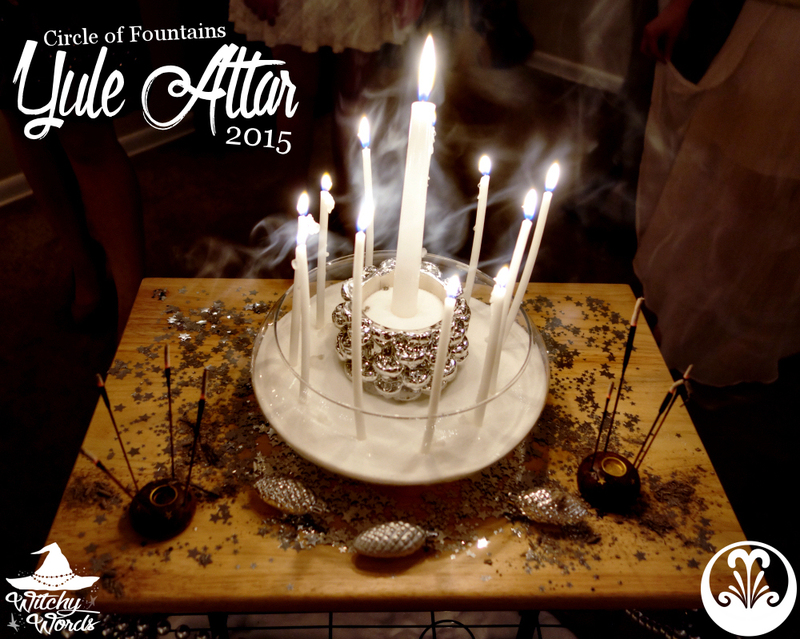 That concludes the Circle of Fountains Yule ritual for 2015! Your circle's rituals are always so well thought out. And inspiring! Sorry to hear that you still aren't feeling great but hopefully you'll be feeling better in plenty of time for the next one. 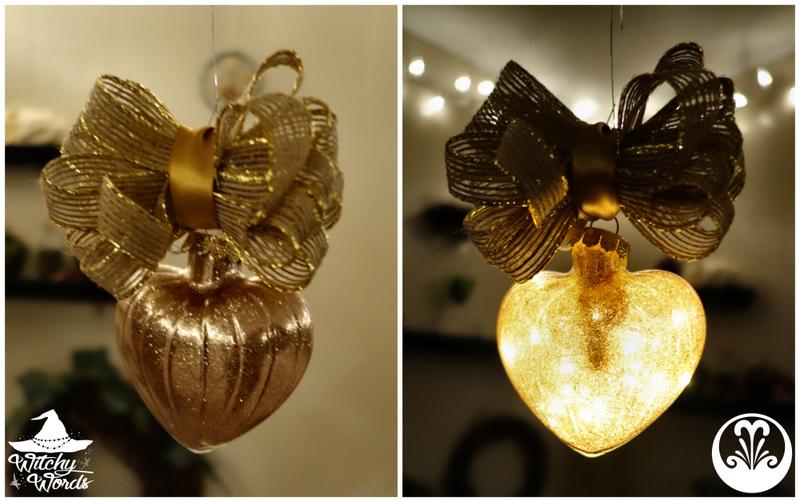 Merry Yule and happy new year! Thank you so much, Liz! I'm pretty proud of how this came out considering how unwell I felt. My GP sent me home with medication on Tuesday and I'm at least able to eat now. They ran tests, so I should hopefully know sometime next week what's going on. I hope your Yule was full of blessings!